Today’s sophisticated machinery and engines require superior lubrication protection. That’s why at Jefferson City Oil and Midland Oil Company we carry a full line of quality automotive and diesel engine lubricants from ConocoPhillips, the company that has been in the forefront of lubricant technology for over 125 years. Conoco is committed to providing you with quality Hydroclear lubricants that meet or exceed the performance requirements of major automotive and equipment manufacturers. Conoco Hydroclear industrial products fit all your needs from hydraulic fluids, compressor oils and gear oils, to metal working fluids, rolling oils, and high temperature greases. Jefferson City Oil Company markets a full and comprehensive range of Conoco, Phillips, Shell and Exxon Mobil passenger car motor oils, commercial and industrial lubricating oils, greases, transmission fluids, and hydraulic fluids. 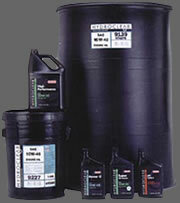 We stock these products for bulk applications or as packaged products. These packaged products can be purchased and picked up at our main office or we can deliver them to you.